Levers water is a picturesque tarn above Coniston, on a clear day the surrounding fells and rocks reflect in the water offering some photographic opportunities. The tarn is located at the head of the Coppermine valley. (You can walk up from the coppermines) The tarn was created to power the mine workings which are prominent in this area and you will be able to faintly see the mine working up on the rocky screes on Coniston Old Man plus there is a mine opening on the south side. I shouldn’t need to say this, but don’t go in there. You might not come back out. At one end of the tarn is a Weir which holds the water in, this can give the tarn a bit of an infinity pool type look when you’re at the other end of the water. From the weir, looking down the stream you also get views of Coniston water down in the valley. 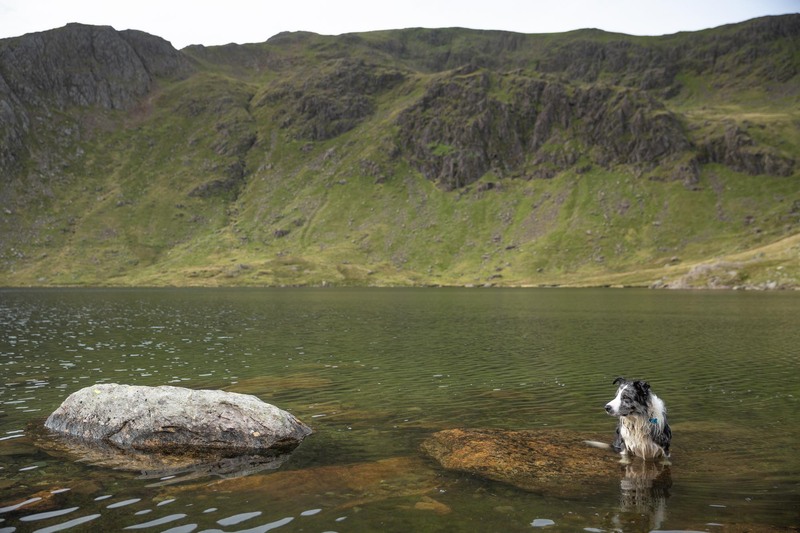 I should have more photographs of this tarn but I mainly have photos of my friend’s dog, Fleck. I borrow him/he borrows me and we go for walks in the mountains. He’s a good model and a good boy. You can see photos from our adventure’s below. You can carry on up the valley and reach Swirl Hawse, going left takes you up to Swirl How, right takes you to Wetherlam.